I've been getting lots of love on Instagram this week for this little project, so I thought I'd share it here as well. I turned the embroidered butterfly on faux leather that I blogged about last week in the tutorial into a clutch bag. I started with two panels of faux leather approx. 12" wide and 14" tall. 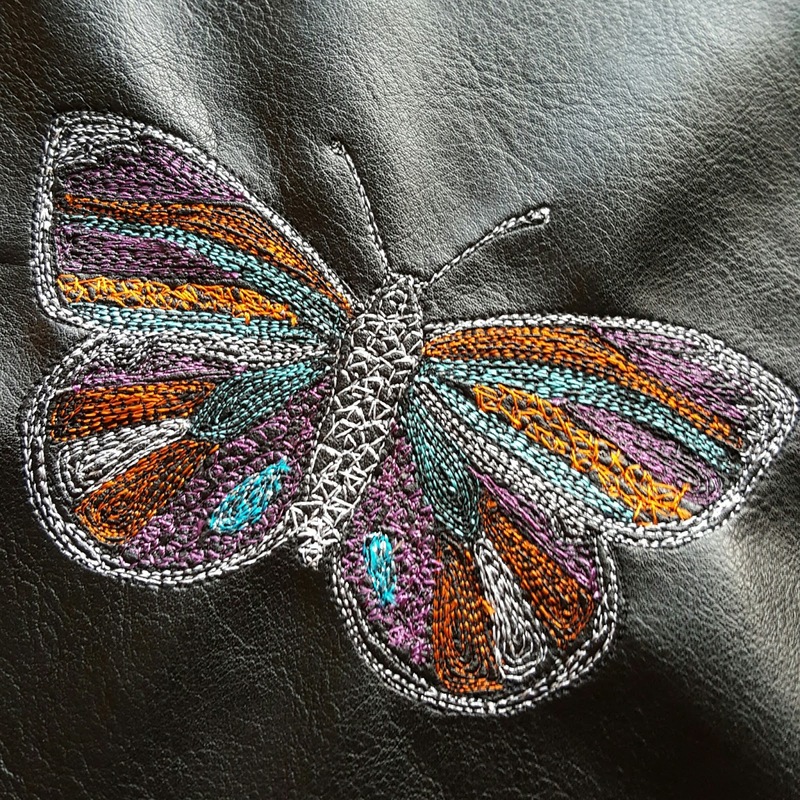 Once I'd embroidered the butterfly on the bottom corner of one I worked out where I wanted my fold to be and marked the position for a couple of magnetic bag fasteners, as these needed to be inserted at an early stage. I love funky linings, and when I was at Fabric HQ last weekend I picked up a remnant of some great Cotton & Steel fabric that I thought would be perfect. I added a zip pocket in the lining, using a method almost identical to this tutorial. If I made a bag like this again though, I'd put the pocket on the outside of the bag, as the pocket is a little hard to access because it's quite low down due to the fold over. The back of this bag is plain, but I think it would look nice with a chunky metal zipped pocket in the back. Something to remember for next time! The bag itself was very simple, just Google zipper pouch tutorial, and you'll find loads of ideas. Once I'd made the pocket, construction of the bag itself was less than half an hour. As I was making the bag I had a few things on my worktable (as always) one of which was a selection of coloured felted balls. Three of the colours matched the embroidery perfectly, so I added them to the zip pull. I love this such a fabulous idea! That pink lining is such a stunning addition. Not what you'd expect from the outside. having a serious bout of clutch envy over here!